The first step on the distance ladder is called parallax. The easiest way to see parallax is to hold out your finger vertically in front of a background object, a door or wall for example. Shut your right eye and note where on the background object the image of your finger appears. Now open your right eye and close the left one without moving your finger. The image of your finger should appear to have jumped to a different spot on the background wall. It is possible to tell how far away your finger is from your eyes just by measuring the distance between your eyes and the distance that the image appeared to move in degrees of arc. Technically, the parallax of an object, measured in arc seconds, is the reciprocal of the distance measured in parsecs between that object and the observer. This can be converted into a distance measured in meters by the equivalence: 1 parsec = 3.086 x 10 16 m. In other words, a star that is 2 parsecs away appears to shift 1/2 arc second on the sky. Historically, parallax has helped make some important astronomical measurements. When determining the distances between planets and their relative sizes, early astronomers had difficulty making precise measurements. It was easier for them to make relative measurements, basing the measurements on the distance between the earth and the sun which they called 1 Astronomical Unit. This relative measurement was helpful, but still needed to be calibrated so that actual distances could be calculated. This calibration was first done by astronomer Giovanni Cassini in 1673. Cassini knew that parallax was an effective means to calculate distance and he also knew how sensitive to the size of the baseline the measurement was. Using the previous example, Cassini knew that by increasing the distance between his two measurements (effectively increasing the space between his "eyes") he could get a larger parallax angle which is easier to measure. 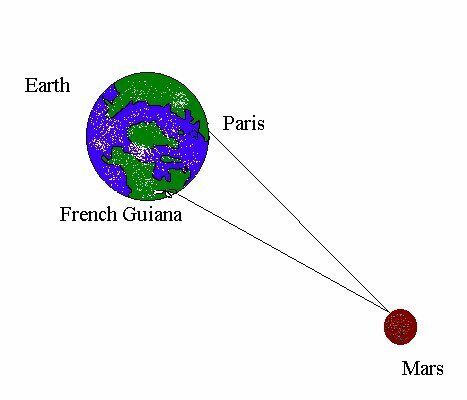 For this reason in order to measure the appearance of mars at its closest approach he sent his fellow astronomer, Jean Richer, to French Guiana to make measurements while he stayed in Paris thereby increasing the distance between his "eyes" to several thousand kilometers. Using triangulation, Cassini was able to make a measurement of the distance to Mars. He calculated a distance of about 140 million kilometers which was only off by 7% of today's accepted value of 150 million kilometers. To see the effects of parallax in the classroom see the parallax activity on the next page.